Saturday saw the penultimate round of our nine-day contest, and was also the occasion of the Finnish national rapidplay championship tournament, so quite a few familiar faces, including some strong masters, were present at the Ellivuori Resort Hotel. Board 1 was a top vs. bottom contest between Norwegian IM Johan Salomon and the clear tournament leader GM Erik Blomqvist. This was not as one-sided as it sounds. The pre-tournament Elo rating difference between these players was only 43 points, so the disparity of their respective tournament performances really amounts to little more than current playing form. The opening was a Queen’s Bishop game transposing into the Mason variation, which is a close relation of the London System. After an exchange of queens on the 12th move, most of the middlegame play consisted of various knight manoeuvres. Though we were anticipating in the commentary room that GM Blomqvist would find some subtle plan to gain a winning advantage, this failed to materialise and the players agreed a draw in a level rook and knight ending on the 43rd move. Danish IM-elect Martin Percivaldi was hunting his personal GM norm of six points, but to achieve this he would have to take one point from his last two games in which the opponents would both be Swedish grandmasters. The first of these tests brought him the white pieces against GM Axel Smith playing on board 2, and this is my game of the round. Play began with a symmetrical English in which GM Smith tried the knight exchange variation with 8 …Ng4. The slightly offbeat idea was to bring this knight onto the same complex of squares as its brother on c6 and then exchange one pair of knights. GM Smith nevertheless soon diverged from previous practice by trying an early queen sortie to a5 on move 11. The subsequent exchange of knights left the queen free to sail across to the other side of the board, and an early exchange of queens followed. The line presents no special problems for white, who held a distinct pull for the rest of the game. White rapidly gained space on both sides of the board and black had to remain flexible. Black’s 24th move …Nf6 enables white to initiate a series of exchanges that lead to a superior rook and pawn endgame in a position with an open e file. White has a queenside pawn majority of four to three and black’s corresponding majority on the kingside is crippled by doubled f pawns. The players examined alternative 24th moves for black in the post-mortem and suggested that 24 …f5 could be preferable, but it is any case clear that black was defending. GM Smith avoided an exchange of rooks in the endgame and set about trying to restrain white’s queenside pawns or generate counterplay elsewhere on the board. The endgame was difficult for black, but he did just enough to hold the draw. White could possibly improve by playing an early g4 to gain a better pawn position on the kingside before black played …h5. White did finally manage to create a passed d pawn, but it soon became clear that this was not sufficiently remote to provide a winning advantage and a draw was agreed on move 52. This result means that GM Axel Smith remains two points behind tournament leader GM Erik Blomqvist with one game left, and IM-elect Martin Percivaldi needs a draw tomorrow against GM Blomqvist to reach the GM norm, whereas a victory would put him in a tie-break for first place. 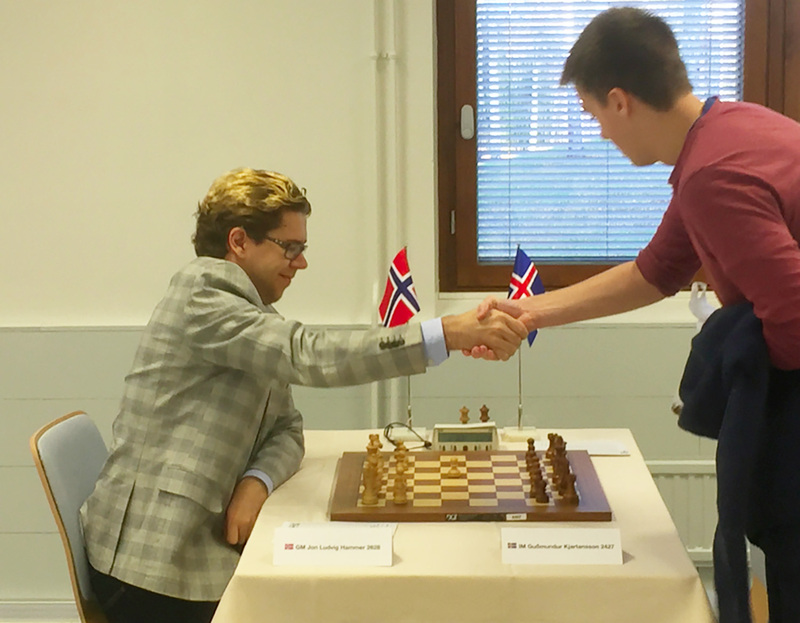 Board 3 was an interesting encounter between Norwegian GM Jon Ludvig Hammer and Icelandic IM Guðmundur Kjartansson. This was another Queen’s Bishop game in which white declined to exchange bishops on d6, allowing black to do so on g3. The recapture with the h pawn opens a line down to h7, and I commented at the time that this could be important if black castled on the kingside, but this would require a radical change in the character of the game. The opening handshake is in the rules. Jon Ludvig Hammer and Guðmundur Kjartansson observe the formalities. A critical point was reached when white finally diverged from previous theory with 10 Qa4. Black must take care not to play too mechanically at this point. The natural response …Bd7 enables white to activate the queen dangerously by making a pawn capture on c5, retreating a bishop to d3 and then swinging the queen across to the kingside. The correct strategy for black is to capture on d4 and thereby prevent white from opening up the 4th rank. White’s recapture with the c pawn opened up the c file with a symmetrical pawn structure. A series of piece exchanges followed quickly and it became clear that white’s general initiative would not be enough to prevent black from continuing this policy of exchanging material and securing a straightforward draw. This disappointing outcome means that GM Jon Ludvig Hammer can no longer hope to win the tournament outright on points, and can only be part of a three-way tie break if GM Erik Blomqvist loses tomorrow. 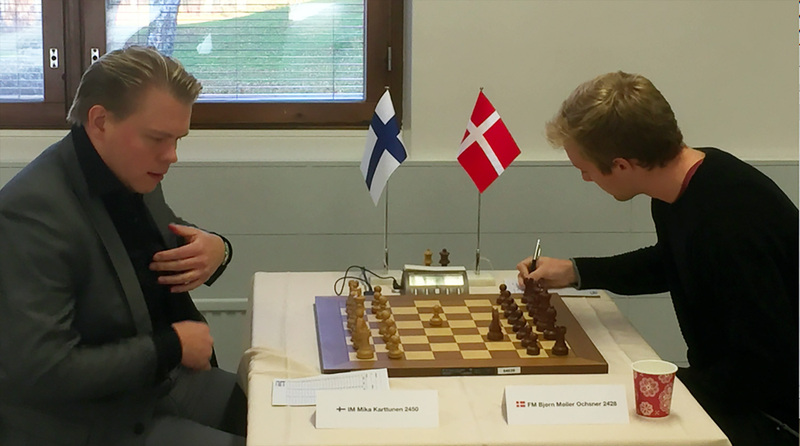 The game on board 4 between Finnish IM Mika Karttunen and Danish FM Bjørn Møller Ochsner was remarkable for its sheer length of 156 moves. Most of these moves were part of an endgame in which IM Karttunen struggled unsuccessfully to find some way to convert his advantage with rook and two pawns against bishop and three pawns into more than a half point. This advantage was gained in turn by exchanging a Catalan bishop for a black rook and a pawn in the late middlegame. Karttunen-Ochsner. One score sheet will not be enough! The opening was a classical open Catalan with early Ne5 by white. Black’s most common response with 7 …Nc6 invites white to give him tripled c pawns, but experience has shown that this is not a serious problem in practical play. White selected a line with Na3 allowing black to snap off this knight with his bishop, giving white doubled a pawns. Black then diverged from the book line by arranging an exchange of his advanced, passed c pawn for white’s e pawn. The manoeuvre leaves white with an isolated d pawn. White then sacrificed the forward a pawn to activate his dark square bishop and initiate a sequence that wins the exchange in return for a pawn and the Catalan bishop. The benefit of having rook for bishop is nevertheless quite minimal in the position, White must compromise the safety of his king and it’s not easy to co-ordinate the rook pair. The rook vs. bishop ending began on move 62, with four black pawns and three white pawns on the board. A pair of pawns was exchanged on move 67 and for the next 89 moves IM Karttunen tried everything he could think of to break down the black fortress. In the commentary room our discussion quickly turned to how many moves had been played since the last capture or pawn move. The computer evaluation was stuck at +1.89 in every calculated line, which simply meant that the machine could find no way to improve this evaluation. A tablebase draw appeared on the board nine moves before the end and finally there was no longer sufficient material to win. 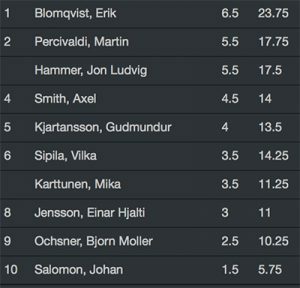 Board 5 was also keenly contested between Finnish IM Vilka Sipilä and Icelandic IM Einar Hjalti Jensson. This was yet another Queen’s Pawn Mason Variation, though the reason for the sudden interest in this opening method remains unclear. Instead of the typical kingside castling or Nh5 on the 7th turn, IM Jensson decided to close the centre with an early…c4, giving the game some superficial features similar to a French defence. A critical point was reached at the 19th move when white launched a tactic that seemed ill-advised. The outcome was to leave black with Harrwitz bishops and the prospects of consolidating a direct attack on white’s king unless white could extend the tactical sequence and force some simplification. On reaching the time control IM Sipila seemed to have solved many of his middlegame problems and had an outside passed pawn in an endgame with rook knight and three pawns against his Icelandic opponent’s rook, bishop and three pawns. Unfortunately things soon began to turn sour for the Finnish IM, who found himself in increasingly severe time trouble. A tactical idea by white to force mate with king, rook and knight at or around move 65 proved insufficient, and on the 73rd move black found a winning tactical idea of his own that decided the game. So after failing to win a single game until Friday, Icelandic IM Einar Hjalti Jensson has now won two in a row against Finnish IMs to reach a total of three points out of eight, just half a point behind those same two opponents. With the last round scheduled to begin at 11.00 a.m. on Sunday, it is clear that Swedish GM Erik Blomqvist is the strong favourite to win our event outright, and that the runners-up are likely to be the initially highest and lowest rated players, Norwegian GM Jon Ludvig Hammer and Danish IM-elect Martin Percivaldi.